Full disclosure, I was provided an advanced copy of this book by the author, however, I have voluntarily chosen to write a review. All opinions are my own. 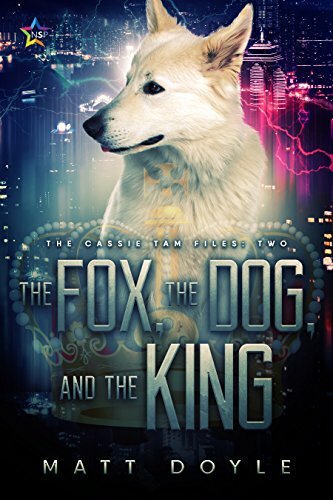 The Fox, The Dog, and The King is the second in the Cassie Tam series of books by Matt Doyle. Picking up approximately 6 months after the close of “Addict”, Cassie and Lori’s relationship seems to be on the right track even if Cassie finds it hard to turn off work to focus solely on her girlfriend. When Lori invites Cassie to a night out she goes along with the plan, but unfortunately, even this couple time turns into work when a mysterious performance artist enlists the PI’s help with locating their missing pet. Cassie’s attempts to track down Kitsune’s beloved dog leads her down an all too familiar path as she finds herself working with the local crime lord and his minions to bring down a rogue operative and protect a racquet bigger than Cassie had ever imagined. For as much as Addict focused on the tech aspect and getting to know the area of New Hopeland and its inhabitants, The Fox, The Dog and The King is more centered around Cassie and getting to know her as a person. I really liked this aspect and it helped to connect even further with the main character as a bit more of her background comes to the fore. Even though the tech was present it wasn’t as much of a focus as it was in Addict. A notable exception, however, was the addition of performance artist Kitsune. Appearing as a mysterious masked fox/human performing a one-person show of sorts with all their personas and personalities this character really drew me in. The way their mystique carried over off the stage also added to the intrigue and really made me want to see more of them. I also noticed that this installment had a slightly less noir feel that I loved in Addict, but even though toned down quite a bit, it was still there. All said The Fox, The Dog, and The King was an enjoyable read and a great addition to this series. I am very much looking forward to future adventure with Cassie in New Hopeland. Yay! I also enjoyed this book 😀 It was nice to see some old characters and new ones, like the granny from the shopping mall, with just a few lines I fell in love with her. Nice review!